Reuben Archer Torrey (1856-1928) was both an evangelist and a Bible scholar. 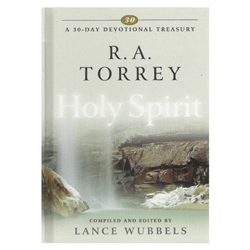 This 30-day Devotional Treasury is a powerful encounter with a legendary spiritual leader whose life and words profoundly impacted the church and the world. Lance Wubbels has selected and edited the richest of several leaders' writings on topics powerfully evident in their lives. Long associated with D.L. Moody, R.A. Torrey became most prominent during world preaching tours in 1902 and 1921. His preaching in Wales in 1902 has been noted as one of the causes of the Welsh revivals of the early 1900's, and spiritual awakenings followed Torrey throughout his career as an evangelist. He was the first superintendent of the Moody Bible Institute and wrote numerous devotional and theological books.